Following a rigorous process of evaluation of both a supplier’s management system and verification of the product, authority to use the PSSA Verification Mark is given and the product publically listed. Evidence is assessed and evaluated by an independent UKAS accredited certification body to verify that the product(s) and/or services concerned meet the above requirements. Following positive recommendation by the PSSA’s nominated independent certification body, the PSSA Verification Mark is awarded to the applicant company and the product/service concerned is listed in the PSSA Verified Products and Services Listings. 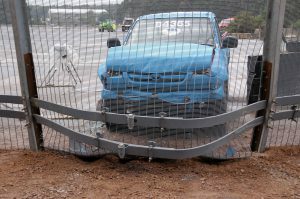 In the 5 years of its existence the PSSA Verification Scheme has expanded beyond its initial remit of Hostile Vehicle Mitigation products. It now includes Security Fences and Specialist Perimeter Protection Installation Companies and is considering other areas such as Perimeter Intruder Detection Systems (PIDS). The Council of the PSSA felt that 5 years of initial existence was an appropriate time to review all aspects of the Verification Scheme and to that end a review involving all stakeholders in the project is now underway. 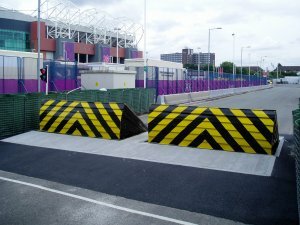 The intention of that review is to make improvements to the scheme based on what has been learned in the first five years, both for participants and the end market, whilst at the same time ensuring it is suitable for a much wider category of external perimeter protection products and services than it was originally established to serve. Whilst this review is underway there will be a temporary suspension to the acceptance of new applicants as the PSSA Council felt it would be unfair to ask organisations to go through a process which may well be changing in the near future. Once the review is complete and decisions about the future format of the Verification Scheme have been taken then the Scheme will be reopened to new applicants. 7500: The Weight in Kg. N3 Vehicles designed and constructed for the carriage of goods and having a maximum mass exceeding 12 tonnes. 80 : Speed in Kph (50 Mph). 90: Impact angle of test in the horizontal plane, between the intended impact face and the approach path of the test vehicle into the test item. 0.0: The penetration of the vehicle is measured from the original position of the REAR face of the equipment. 0.0 : Where major debris landed beyond the original position of the rear face of the equipment. N2 Vehicles designed and constructed for the carriage of goods & having a maximum mass exceeding 3,5 tonnes but not exceeding 12 tonnes. 64 : Speed in Kph (40 Mph). 2.2: The penetration of the vehicle is measured from the original position of the REAR face of the equipment. 0 : Where major debris landed beyond the original position of the rear face of the equipment. 1.0: The penetration of the vehicle is measured from the original position of the REAR face of the equipment. 19.4 : Where major debris landed beyond the original position of the rear face of the equipment. 5.4: The penetration of the vehicle is measured from the original position of the REAR face of the equipment. 3500: The Weight in Kg. N1 Vehicles designed and constructed for the carriage of goods and having a maximum mass not exceeding 3,5 tonnes. 48 : Speed in Kph (30 Mph). 1.5: The penetration of the vehicle is measured from the original position of the REAR face of the equipment. 5.3: The penetration of the vehicle is measured from the original position of the REAR face of the equipment. 2.0 : Where major debris landed beyond the original position of the rear face of the equipment. 0: The penetration of the vehicle is measured from the original position of the REAR face of the equipment. 7.9 : Where major debris landed beyond the original position of the rear face of the equipment. 0.5: The penetration of the vehicle is measured from the original position of the REAR face of the equipment. 6.9: The penetration of the vehicle is measured from the original position of the REAR face of the equipment. 4.1: The penetration of the vehicle is measured from the original position of the REAR face of the equipment. 25 : Where major debris landed beyond the original position of the rear face of the equipment. 7200: The Weight in Kg. N2A Vehicle is 7.5 Tonne European specification type vehicle. 0.0: The penetration of the vehicle is measured from the original position of the FRONT face of the equipment. 7.6 : Where major debris landed beyond the original position of the rear face of the equipment. 13.5: The penetration of the vehicle is measured from the original position of the REAR face of the equipment. 25.4 : Where major debris landed beyond the original position of the rear face of the equipment. 2.5: The penetration of the vehicle is measured from the original position of the REAR face of the equipment. 3.0: The penetration of the vehicle is measured from the original position of the REAR face of the equipment.